TJ Maxx, HomeGoods and Ross… Oh My! The discount stores are offering up a whole slew of creepy creeps this year, mostly in the form of decorative Halloween busts and statues. Two of the best are the Headless Horseman statue and the Frankenstein’s Monster bust. First up is the Headless Horseman statue. Available at Ross, this beautiful statue is quite heavy and elegantly sculpted. It has more detail than the Horseman statues released at HomeGoods several years ago, and it is also a bit bigger. It also features a lighted pumpkin head. Coming in at $14.99, it’s a real steal. Next up is the Frankenstein’s Monster bust sold at TJX stores. Available at select HomeGoods, TJ Maxx, and Marshall’s stores, this Frankenstein bust is a re-release of a bust from last year, but it has an all-new paint job. Bearing a strong resemblance to our favorite man-made monster from 1931, this bust features gruesome green paint and lighted LED eyes. A bit more pricey than the Headless Horseman, the Monster bust is definitely heavy and quite worth the price of $34.99. Now it’s your turn. Tell us what you have found at the discount stores this season! Any opinions expressed in the following article do not constitute an endorsement of any product or retailer. The following is for information purposes only. One of our newest features is called “Swoop’s Scoop,” brought to you by our new friend, Swoop the Bat. Swoop’s Scoop lets you in on upcoming merchandise of interest to fans of Horror and Halloween, and also gives you the scoop on some of the most affordable finds of the Halloween season. Look forward to this feature throughout the coming weeks. Our first installment is a basic overview of where you can track down some really awesome Halloween deals. Many people believe that the only time you can get great offers on Halloween merchandise is on November 1. That thinking is flawed. 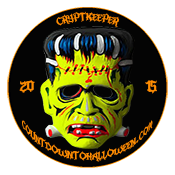 While that may be the case most of the time at the big box retailers, there are great Halloween deals all season long at discounters. Ross and Tuesday Morning both offer high quality items at 50-70% off their original retail prices. You can expect to find everything from snowglobes to vintage reproduction pieces at these “boo-tiques.” In addition, these types of stores have been known to get shipments from mainstream manufacturers like Department 56 and Annalee. In addition, Big Lots has its own unique lineup of Halloween merchandise, offering markdowns on items that are similar to those you would find at major retailers and specialty stores. Looking for skull lights or pumpkin path finders? What about spooky signs and yard decorations? They have all of these items and more! Another place to get great deals on Halloween is one you probably wouldn’t expect – the Halloween specialty store. In larger cities, there are entire facilities dedicated to discounted Halloween costumes and decorations. But if your city doesn’t have one of these haunts, you may want to check with the mainstream Halloween stores. Many places, like Spirit, offer select merchandise from previous years at discounted rates, so it’s definitely worth asking one of the sales associates if a discount section exists. Well that covers our overview. Swoop will be back with posts about great finds all season long, so bookmark us or subscribe!